The award-winning Chewton Glen Hotel and Spa has recently developed their own unique Treehouse accommodation in a secluded valley within the 130 acres of grounds that surround the hotel. The Treehouses at Chewton Glen are unique in every sense, built high among the trees each of the twelve Treehouse Suites provides an unforgettable setting for unwinding. They are a tranquil oasis where guests can truly relax with a first class entertainment system. Airwave supplied and installed the latest Samsung 40” Hospitality TVs as well as 19” Tilevision screens in the bathrooms. The Samsung LED TVs offer brilliant high definition picture and the super slim screens fit elegantly into the rooms. Guests can watch the full Sky HD channel selection, including movies, sport, music, entertainment and more. Airwave also supplied Blu ray players and Teleadapt MediaHub HD units, allowing guests to connect their devices seamlessly to the Samsung screens and play out their own music, series, movies and view photos and videos. Apex Temple Court Hotel is a 4 star luxury hotel just off Fleet Street, London. The stylish hotel boasts 184 luxurious bedrooms and suites, a restaurant and bar, exclusive Club lounge and gym, all centred round a grand courtyard. Airwave installed an IRS system into the hotel allowing the reception of terrestrial Freeview TV channels and satellite delivered International channels, all on the same coaxial network. This was installed in combination with a Samsung SIRCH head-end; allowing the hotelier to select the channel listing for all rooms from a central point and distribute throughout the hotel. In the suites and deluxe rooms, Sky HD was also installed, offering the widest range of entertainment available. Airwave supplied the latest Samsung 40” LED screens and CMS1 software, allowing the hotel to broadcast information, news and services to guests on their in room TVs. 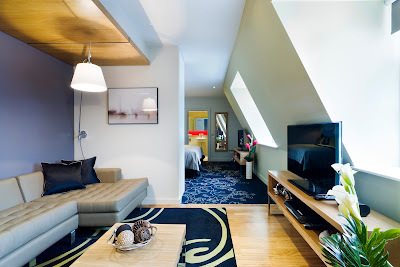 Guestrooms also boast Teleadapt Media Hubs, allowing hotel guests at Temple Court to connect their devices and play out their own personal content on the TV screens.